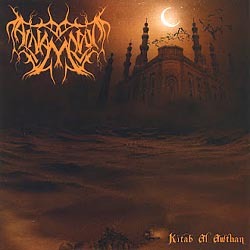 Arabian black metallers Al-Namrood return with their third full length album “Kitab Al Awthan”, continuing where their previous works ended. The band was formed in 2008 in Saudi Arabia and still resides there; not the most common place for metal bands. Since their beginning they signed to the Canadian label Shaytan Productions, who has released both their previous albums, as well as their debut EP “Atba’a Al-Namrood” in 2008. The band plays oriental folk black metal, mixing their homeland’s music with raw black metal. Since their beginning it was obvious they had an underground approach and production to their music and this is something that hasn’t change. Of course the sound quality of their music is improved with time and each new album has a more professional production than its predecessor. “Kitab Al Awthan” is the best album of the band so far and one of the best efforts in blending oriental music with extreme metal. Al-Namrood seem to have find the perfect balance in the mixing, so all instruments are in the correct level and none is dominating over the others. In the past I found guitars more weak, often put into the background. Now they sound more powerful than ever and of equal importance with the synths and traditional folk instruments. Oriental instruments are still used extensively, but they sound more natural this time, cooperating better with the guitars. The main reason for this more balanced sound is that they actually use electric guitars like a traditional instrument playing oriental rhythms and tunes, but at the same time they manage to keep their black metal identity. The vocals remain at the typical brutal black metal style, being perfect for this evil archaic atmosphere their music creates. Lyrics are in ancient Arabic language and they travel the listener to the pre-Islamic era of Arabia and according to the band to the real roots of Arabian history. Al-Namrood bring to life tales of ancient djinns, demons, desert battles, demigods and deities, while the album title translates to “Book of Polytheism”. Al-Namrood is a great band in the underground folk black metal, that can easily stand out from the rest, mainly due to its origin and the uniqueness of its culture. The distinctive eastern roots of their folk music bring fresh air in the overcrowded Celtic scene and offer a very interesting alternative to the fans of folk black metal. In my opinion they sound like a more underground and definitely more folk oriented version of Melechesh. You can visit their myspace page to listen to some songs, or visit their label’s page to purchase the limited to 1000 copies “Kitab Al Awthan” album or their previous works. Shaytan Productions is also preparing a special box set for the end of 2012 or early 2013; something like a collection with remakes and remasters of their best songs, limited to 250 copies.